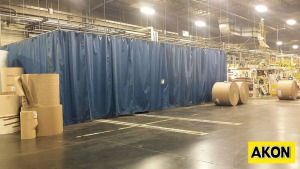 Warehouse Dust Control curtains are easy to install and can completely surround the source of the dust which will keep the air quality in your facility clean. Here are some of the airborne particles which are commonly contained. The curtain cubicles or one sided curtain walls can keep the contaminated air from harming your workers and your guests. The curtain will prevent them from breathing in the dust, fumes, or any other airborne contaminant. In addition, you will be keeping your facility clean and professional looking. Our industrial dust control curtains are a proven way of creating contamination free environments. They are also the most viable economical alternative to more expensive hard wall structures. They perform just as well, and will not compromise your limited budget. With our large selection of materials and mounting options, we can ensure you that you will receive exactly what is needed to contain the dust which your processes are creating. Each curtain is custom made to your environment and dimensions.